The Moon (and therefore the mooD) wants to be immersed in wholeness. The emotional experience is wide, includes everything. Here’s a personal experience to (hopefully) explain those first few sentences better. The Moon is moving through my own 9th house now so I am describing from that point of view. Everything seems linked to everything else emotionally much too easily right now. Example: when one thought/feeling comes up, it’s like a Google search return/result. I feel “this” because of “that” which is related to “this other thing” and while the emotions cannot be safely or securely compartmentalized, in order not to go into “overwhelm”, it’s best not to go into the one first though/feeling because it leads to all the others much too easily—immersed into the wholeness of it all. This 9th House Moon relates to the archetype of the house ruler Jupiter/Sagittarius. “Big Picture” is one archetype here. Personally, the feeling I have about anything emotional right now is this: best not to “go there” with that first feeling. Better to let all those emotions go or drown in them. That’s a personal example of wide experiences that are associated with the 9th house and corresponding Jupiter/Sag largeness. Jupiter, by the way, is known to intensify and expand any area that it touches. So if a Moon is here in the 9th, it is looking to feel secure and happy (as all Moons are), it has to consider the whole big picture with emotional things. This can be good or bad depending on what the other astrological influences the Moon is involved with at the time. But no matter what the other influences are, one is that the Moon will affect our psyche in such a way that it gathers up and unifies all emotional links, binding them together in a big picture. The emotional nature during this transit could be attracted to something outside of personal cultural norms in order to feel secure or happy–philosophy, long distance travel, interest in other cultures are all 9th house archetypes and a Moon here could trigger those interests as a way of feeling emotionally happy. One example of that may be turning to spiritual beliefs or rituals that are outside of one’s own culture. Perhaps a westerner turning to Hindu or Buddhist philosophy to cope with or resolve any emotional discomfort of the day. Generally the mood during the time of this lunar transit could be extremely sensitive to moral issues. One specific example could involve the karma of truth-telling versus telling lies. Personally, I seem to experience people who change their tune based on their current changing needs and therefore their version of the truth changes based on their current need, desire or mood. The 9th and it’s polarity the 3rd is sometimes called the “truth versus lies” axis and it’s also known as the B.S. axis too. Essentially, the 9th house Luna is looking for “meaning” in the life at the time of this transit. The ‘search for meaning’ and also the ‘big picture’ archetypes could be why the intuition and right brain are associated with this house. Luna here would trigger the right brain and intuitive faculties. So the theme here is “the search for truth” and “the search for meaning”. Some call this house “The House of the Believer”. Our emotional connections during this transit may be prompting us to ask “What do I believe?” And each month during this transit those beliefs may change or restructure a little bit based on emotion. Another consideration is that our emotional responses to this searching and belief-adjusting and other emotional triggers can cause us to “damn the torpedoes” as the saying goes or to take a course of action despite known risks! We could leap wide-eyed into the unknown. However we respond to life with Luna stimulating this area of our life, it is good to remember that we’re motivated by our own (sometimes selfish) desire to feel happy and secure. Dreams could be more active at this time, and as mentioned above, our personal philosophy could be adjusted or changed at this time due to our emotions. If we are waiting for the manifestation of something we wish to create or experience in life, this is a time when it will be difficult to be patient–impatience (an emotion) will be most acute at this time. When Luna triggers the 9th house area of your life as I’ve been describing in this post, it is a good time to get away from ‘the ordinary’. Maybe read a book that will give you some new pictures and perspectives about your concerns now. Its a good time to take a class, to learn something new that will help you with faith, intuition and/or philosophy. Your emotional nature will be attracted to this naturally when Luna moves through your 9th house. New areas of interest fulfill emotional needs at that time. As I write this blog post Luna is in my 9th house . And I ordered a book today about writing and publishing. This feels very emotionally satisfying. It’s right on time. 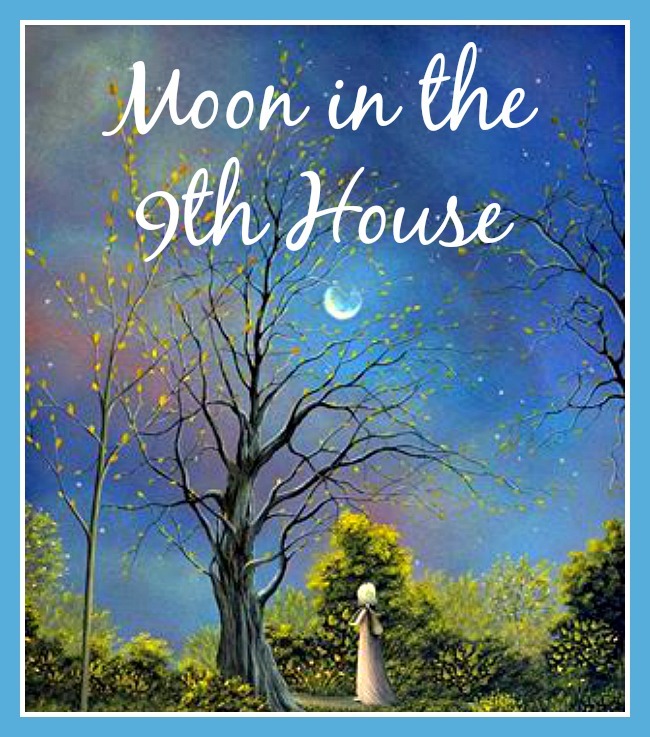 The 9th h house is about learning new things and it’s known for its connection to publishing. Learning something new fulfills my emotional needs now and by the way another archetype of the 9th house is education. These are the kinds of endeavors that enhance one’s happiness and sense of satisfaction and security when the Moon transits the 9th. Planning a trip could also be something that fulfills emotional needs as Luna moves through this house of your chart—especially if this travel involves going to a foreign place. Generally, optimism is assigned to this house and so this lunar transit is usually a time when this emotion is more prominent–one has to simply use care about the level of optimism balancing it with practicality. Next, the 10th house! As I finish typing this post, the Moon has already arrived in my 10th. Last night I tripped over a pair of shoes that one of my roommates left in front of the door. It was dark. I nearly feel but kept my balance thinking of how broken bones could could have resulted had I not. The 10th is ruled by Saturn and Capricorn whose archetype relates to structure and bones; grateful that all mine are intact despite a near fall. If you’re following these posts, see you in the 10th House!